If you usually work on a laptop and you plan to move to standing, you may want to consider purchasing a standing position laptop stand instead of a full-size standing desk. You may decide to splurge for the full-size standing desk in the end, but if both space and money are constraints, you do have options. 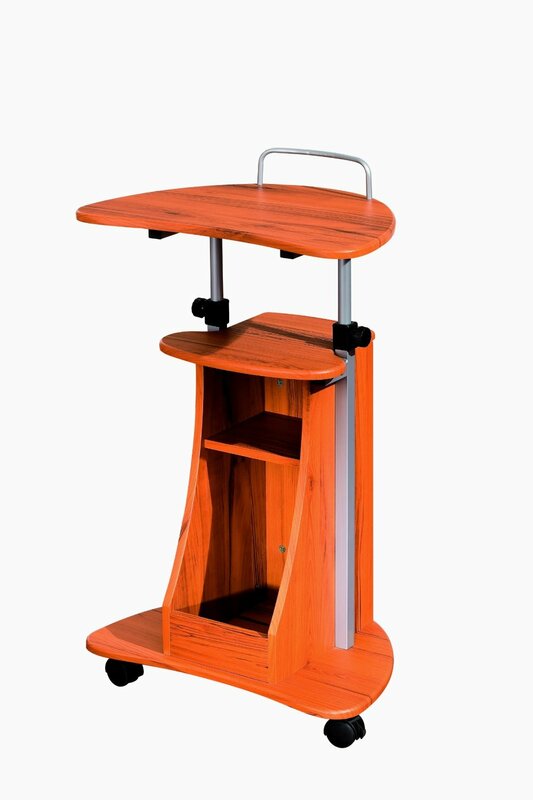 There is one extremely popular and, dare we say, incredibly inexpensive laptop stand we want to tell you about – the Techni Mobili Laptop Cart, which is currently selling on Amazon for $49.88 plus free shipping. Now the main reason this stand is so cheap is that it is made of MDF and PVC instead of sturdier, more expensive materials, so you’ll need to adjust your expectations, particularly about its appearance, accordingly. But its key feature, when it comes to using it for the purpose of standing, it that it has an unusually broad height range as compared to similar products: 35” to 44”. An Amazon reviewer who is 6’4” tall is able to use it as a standing desk when it is extended to its full height. Many purpose-made standing desks are not high enough for people who are that tall. In general, Amazon reviewers are extremely impressed with this product and many of them state that it exceeded their expectations for such an inexpensive piece of furniture. Out of 267 reviews, 171 buyers gave it five stars and 64 gave it four stars. The most negative reviews complain about the cheapness of the fittings – and state that it is difficult to put together. This is in stark contrast to the positive ones, many of which express surprise that it is so easy to put together. It seems that there are a few “dud” products being shipped out – or maybe some buyers are just better with their toolkits than others. (In any case, it would be wise if you were primed to return the product in the specified time period if you did happen to get a dud.) And one negative reviewer, who gave the product only one star, complained that her main problem with it was that it was too high for her to use while seated on the sofa. This clearly wouldn’t be an issue with those who want to use it primarily for standing at work! One caveat: this is definitely a standing position laptop stand. The desk area is only large enough to hold just that — a laptop. Reviewers remark that there isn’t even room for the addition of a separate mouse. Overall, though, if you use a laptop as your primary work computer and you want an inexpensive way to get on your feet more throughout the day, the Techni Mobili Laptop Cart is a solid bet — albeit one made of MDF and PVC. I love standing desks. This one looks a lot like a podium though.